After the railroad connections to Springfield and Boston were added in 1853, Amherst center continued to be the urban focus. Residential development flowed to the east along Main Street toward East Village and to the south along South Pleasant Street. The Amherst Railroad Depot built in 1853 remains a vital transportation connection for commuters. 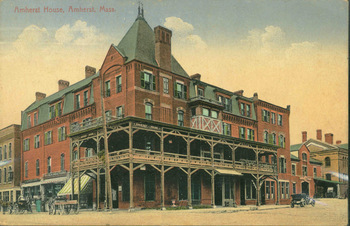 The development of the Amherst town common dates from the mid-nineteenth century. In the 1840s the west end of the common was granted to the College by the town. The north side of the common was used as a cow pasture and there was a frog pond near the center of it. Amherst College commencements were held on the common and Commencement Day grew huge with peddlers, auctioneers, booths, tents, and “fakirs” adding to the colorful melee. Cattle shows were held on the common from about 1845 to 1859. Edward Dickinson in 1857 organized the Amherst Ornamental Tree Association out of his concern for beautifying the public common. In 1864 fifty shade trees were planted and by 1874 grading and filling of the common was ongoing. About this time, the Amherst Ornamental Tree Association engaged Frederick Law Olmstead to design a plan for the common. However, Olmstead’s plan was never implemented. There were commercial buildings in the Main and Pleasant Street area prior to the major downtown fire of 1838. After this disastrous event, commercial rebuilding was extensive. Several rows of three- and four-story brick buildings were constructed. The Cook Block (ca. 1840) is said to have been named Phoenix Row by Professor Hitchcock because it arose from the ashes of the 1838 fire. More fires in 1859, 1872, 1877, 1881, and 1883 heavily damaged the downtown and extensive rebuilding followed each.